In an effort to promote multiplayer harmony and the joy of giving, the people behind the recent, critically acclaimed strategy game Achron have rolled out a pretty solid two for one deal. If you're unfamiliar with Achron, and its novel strategy-meets-time-travel gameplay, I will politely direct your attention to our recent review, in which we dubbed it "the most unique RTS you'll play this year." Presumably that sort of praise has made a few of you strategy geeks curious about the game, and in an effort to reach and out touch as many fans as possible, while simultaneously promoting the game's multiplayer element, Hazardous Software is now offering a gratis copy of the game to anyone willing to fork over the cash for a purchase. Spawn game functionality is something our fans have been asking for for a long time. We chose to go a step further, by including a free gift code for Achron with every purchase. This offer is retroactive to all purchases from the beginning of Achron's preorder release. It also lowers the bar of entry to many in the PC gaming community who have expressed interest in exploring Achron's well-received time travel mechanics. Why would Hazardous do that, you ask? "We believe in supporting the multiplayer community and enabling community growth, including the pathfinding patch released yesterday, which marks a noticeable improvement in Achron's gameplay," said Shawn Stonesifer, the game's associate producer. Alongside this announcement, Hazardous has also released a patch for the game that improves a crucial flaw in the title's AI. 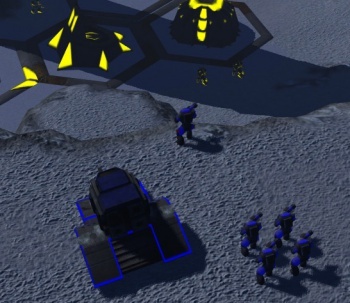 "It fixes a critical pathfinding bug where units would not move intelligently, among other improvements," the release states. The most impressive part of this announcement is that this new, generous deal retroactively affects any and all copies of the game already purchased. If you bought Achron at launch, you suddenly own an extra copy of the game. I'd like to think that's a subtle metaphor for the game's intrinsic time-travel mechanic, but it's probably just the Hazardous PR department trying to avoid consumer outrage. Plus, the dev team is probably too busy using the time machines to invent rock and roll and make out with Lea Thompson circa 1985.